An online campaign about people’s love for Northumberland parks has caught the eyes of Keep Britain Tidy judges for the second year running. 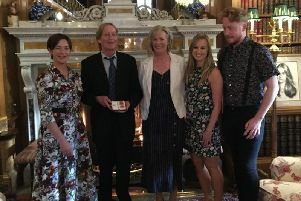 Northumberland County Council won the national award last year, and it has been shortlisted again for 2019, for a campaign featuring a wide range of people including the Duchess of Northumberland and BBC TV’s Carol Malia. In addition, a further award submission from Northumberland has also been shortlisted as the Morpeth Litter Blitz group and Dai Richards have been recognised in the Litter Heroes category. The Duchess said she loved coastal locations with her young family while Look North presenter Carol remembered a funny family story when her father had a wardrobe malfunction when he was carrying her on his shoulders at Plessey Woods Country Park. Peter and Julie are both regular visitors to Druridge Bay Country Park. They spoke of their special memories of the park – where they met on a date 15 years ago. They have been together ever since, are now happily married, and have remained regular visitors. The Love Parks initiative aims to ensure that residents and visitors use local parks and protect these important green spaces, and the award was open to entries from all local authorities in England and Wales. Coun Glen Sanderson, cabinet member for environment and local services, said: “This campaign gave us a golden opportunity to enhance the promotion of our parks and the activities and things that people can enjoy there to a wide audience across Northumberland and the wider region. “We also wanted to support pride in the parks for those who work there, for our volunteer groups and for those who visit and enjoy them. “Local services staff and parks team members encouraged many residents and visitors of all ages to show why they love their local park, such as having their photo taken with the Love Parks heart or making a video clip. Photos and videos were posted on the county council’s social media channels throughout the week, building a colourful campaign which demonstrated the fantastic features of the 12 parks across the county that are managed by the local authority. The winners will be announced at the annual national Keep Britain Tidy network conference next month.